-Stephanie: Eric was so happy that I made those chocolate and coconut macaroons. They are his favorite. -Stephanie: Since he saw them at an Italian bakery, he has been so eager to try them. -Eric: Don’t get me wrong, the macaroons were delicious but did she forget that I am on a diet? Can’t she stop tempting me with those never ending sweets? -Stephanie: I usually don’t eat a lot of cookies. It is mostly for him that I baked these goodies. His f-a-v-o-r-i-t-e! -Eric: I try not to eat a lot of sweets. I mean, come on! I gained four pounds since the beginning of her blog and she’s lost six. -Stephanie: He has been so supportive since the launching of my food blog. Sometimes, he even gives me some advices on food styling and photography. -Eric: It was fun, in the beginning. I am as much passionate about food as she is; but now, I just wanna have an enjoyable meal without constantly talking about the new recipes she is planning to explore or about the difference between flan, crème caramel and custard! In a bowl, mix the coconut with the condensed milk and the vanilla. Set aside. Whip the egg whites and salt until medium-firm peaks. Carefully fold the egg whites into the coconut mixture. Line a baking sheet with parchment paper and drop the batter using an ice cream scoop or simply too teaspoons. Bake for 25 to 30 min in a preheated 325F until they are golden brown. Let cool on a wire rack. In the meantime, place the chocolate in a bowl. Heat the cream until bubbles form around the edges. Pour it over the chocolate and whisk until the chocolate has melted. 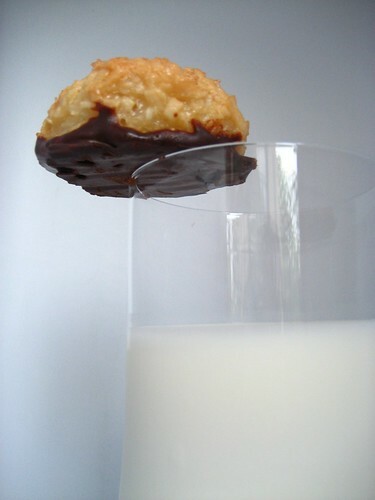 Dip the bottom of the coconut macaroons in the chocolate and put it on a large plate lined with parchment paper. Chill for about 2 hours or until the chocolate sets. Store the macaroons in an airtight container and refrigerate. Dans un bol, melanger la noix de coco, la vanille et le lait concentre. Dans un autre bol, mettre le sel et les blancs d’oeufs et battre en neige. Incorporer les blancs delicatement au melange de noix de coco. Garnir un grand plat allant au four avec du papier sulfurise et prechauffer votre four a 160C. A l’aide d’une cuillere a crème glacee ou de deux cuil a café, former des petites boules de la pate et mettre sur le plat. Faire cuire pendant 25- 30 min jusqu’a ce que la surface des macarons soit doree. Laisser refroidir sur une plaque a patisserie. Entre temps, mettre le chocolat dans un bol. Faites chauffer la crème liquide et enlever du feu juste avant l’ebulition. Verser doucement sur le chocolat et melanger a l’aide d’un fouet jusqu’a ce que le chocolat soit fondu. Tremper les macarons dans le chocolat et les poser ensuite sur une assiette garnie de papier sulfurise. Mettre au frais pendant 2 heures ou jusqu’a ce que le chocolat durcit. Ranger ensuite les mavcarons dans une boite hermetique et mettre au frigo. Petites astuces: Il vous restera surement beaucoup du glacage au chocolat. Si vous n’allez pas l’utiliser tout de suite congeler-le et quand vous voudriez l’utiliser, sortez-le du freezer la veille et le jour venue le faire fondre au bain-marie. Your pictures make me want to make these little morsels despite the fact that my husband is a diabetic! I had to check out your blog when I saw the title since my first kitchen (which I had for 17 years and 5 kids) was maybe a little bigger but also housed the furnace and hot water heater! Tes photos sont superbes! Véritable supplice! Oh your macaroons look delicious! wow, I am blown away by that photo. Superb! These look superb! I think I may try them tomorrow!! J'adore ton intro, c'est vrai que c'est tellement ca...mais bon, faut pas se plaindre quand meme, parce que sinon ;-) Bien joué, j'aime bcp les contrastes ! This is one of the most beautiful pictures I've seen! How gorgeous and tasty that looks. 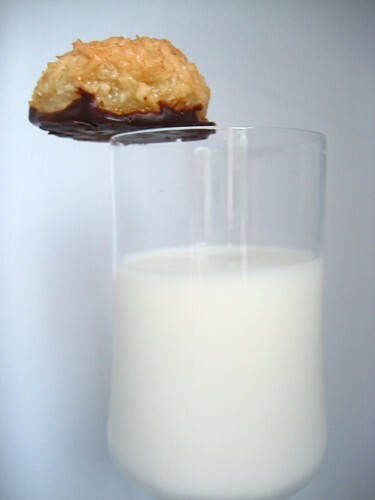 I feel like I could just tip that macaroon over into the milk and pull it out and eat it right now! An adorable post as always! Your husband is so lucky to be your chief taster! Its a beautiful picture and a beautiful macaroon. Its always fun to be the guinea pig to great desserts. Beautiful macaroons and such a cute post! My hubby also has to deal with my food bloggy obsessions, like how I take photos of everything before we can eat it, lol. It would be so interesting to get the other side of the blogging story from the SO's of bloggers, wouldn't it? Hilarius dialogue! This might be interesting to look into the secret lives of those-who-are-partnered-with-a-blogger. not only a clever post, but a clever balancing act with the macaroom, haha! OMGosh! This recipe just made your blog one of my favorites. I'm just starting my own food blog and visiting others. Your photos are incredible. - Thank you very much Deborah. If you do try them just don't take me responsible for a hyperglycemia. - Lis, My hubby said he is on a diet but never turns down my desserts. - Il faudrait vite courir en acheter Sha. Merci beaucoup pour ton message. - Thanks for your advice Kelly-jane. Actually I am looking to adopt all my neighbors. - Ah non, y'a pas de quoi se pleindre...je m'amuse a le torturer avec mes petis plats c'est tout. Merci pour ton mot Claude et bonne semaine a toi. - I guess it is every food blogger reality household Dolores. - That's what you are supposed to do Anali. Thanks for your nice words. - Thank you very much Freya. - This what you get when you are a food blogger Patricia. - Can't wait to see what you are going to do Jaden. - I agree with you Kristen. That would great to see. - You are so nice Betty. Welcome to "the gourmet blogosphere".